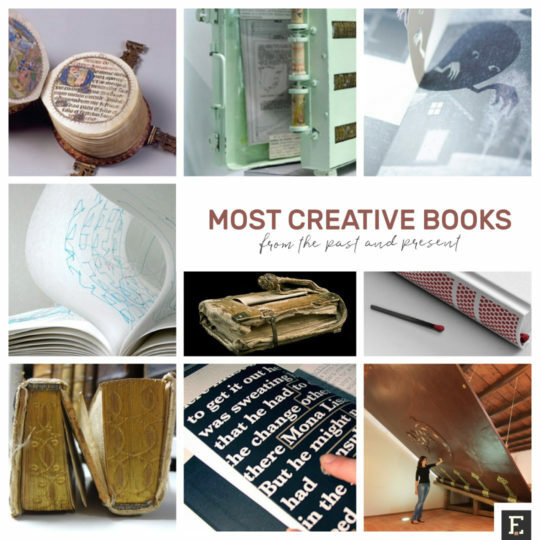 Most creative books ever made, in one place. 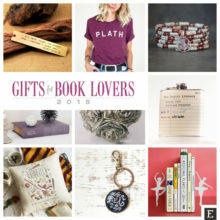 Medieval girdle book, air pressure electrical book, sensory book, and many more. A single object that inspires most creativity is the book. 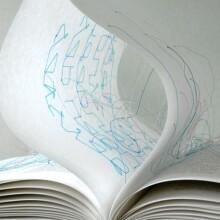 Books are the essential material for creative book art, but this post is not about it. In the overview, you’ll find the books created to serve the purpose all other books serve – to be read. As you’ll see, book creators adjusted this primary purpose to specific needs of book readers living in different times. 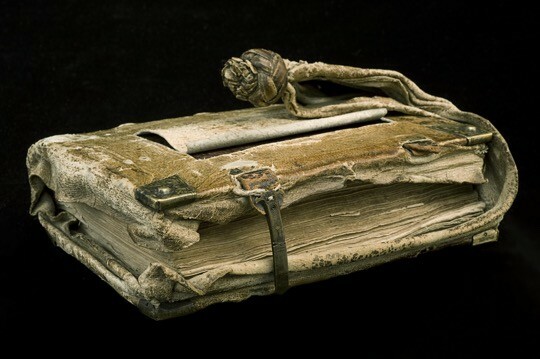 A medieval book that you could read six ways. 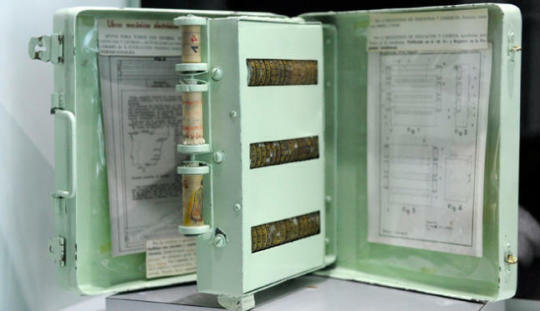 A book which operates thanks to air pressure mechanism. 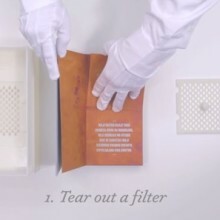 A book through which you can filter water. These are the most wonderful examples of how we can reward the book for making us creative. 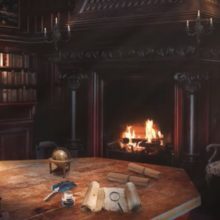 Most of the medieval books in this list were found by Erik Kwakkel. He is a Dutch historian who specializes in old manuscripts and paleography. You should follow his Tumblr blog for new images and stories about medieval masterpieces. 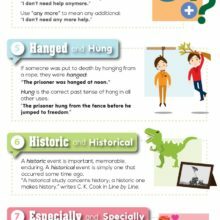 Do you think this list is missing a great example of creative books? 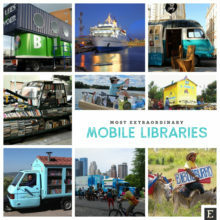 From donkey-drawn trolleys to huge ships, these contemporary mobile libraries are born out of passion, creativity and determination. 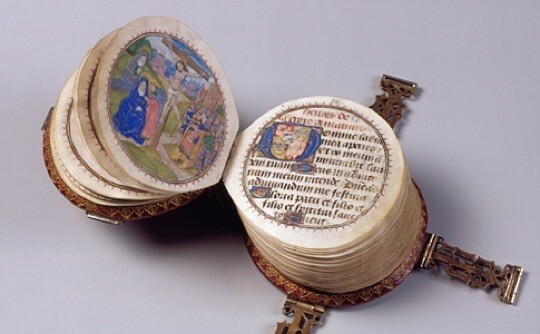 Every miniature book is a piece of art, but a miniature book that is circular is a masterpiece. This exceptional book, Codex Rotundus, was crafted around 1480. It was a book of hours, a Christian devotional book popular in medieval ages, written in Latin in French. Despite being only 9 cm m in diameter, it consists of 266 pages. The book spine measures only 3 cm, so the book must be held together by 3 clasps. The clasps are monograms shaped in the form of different gothic alphabetic letters. 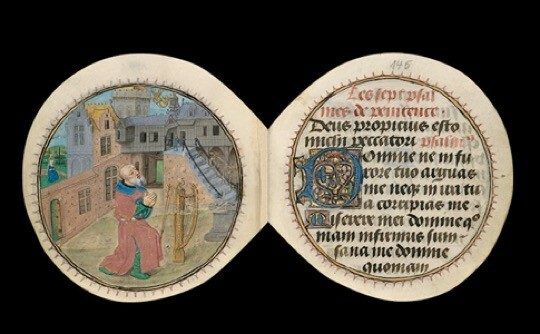 The creator of Codex Rotundus, an anonymous book painter from Bruges, Belgium, not only beautifully designed the text inside the round pages but also painted 30 exceptional initials. The girdle book was a portable volume a person could tuck under his girdle or belt. There was a knot, being a part of an exterior leather cover, that was holding the book behind the belt. Why was the knot made at the bottom of the extended leather layer? The answer is simple. 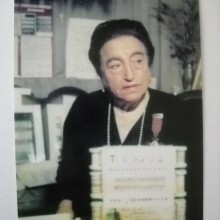 That way the book was hanging upside down, so the owner could pick it up and read at any time, without the need to remove the book from under the belt. 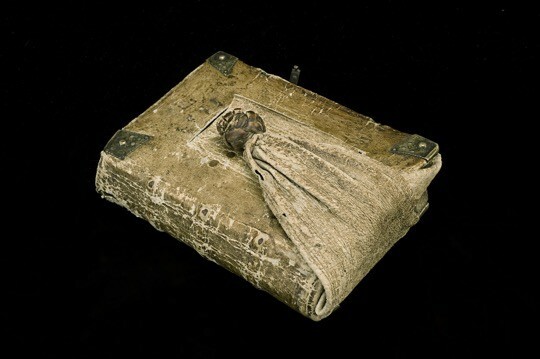 Girdle books were common in Germany and the Netherlands between 1400 and 1550. This particular one was made in 1508. 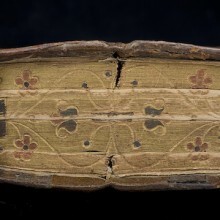 The exterior knotted leather cover was added in 1589, thus making it a girdle book. 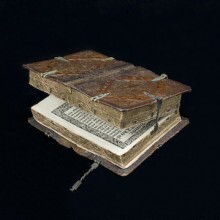 The books with a special binding type called “dos-à-dos” were produced in the 16th and 17th century. Erik Kwakkel calls them “Siamese twins.” It’s the most appropriate definition. The books, while having different fronts, share the same back. 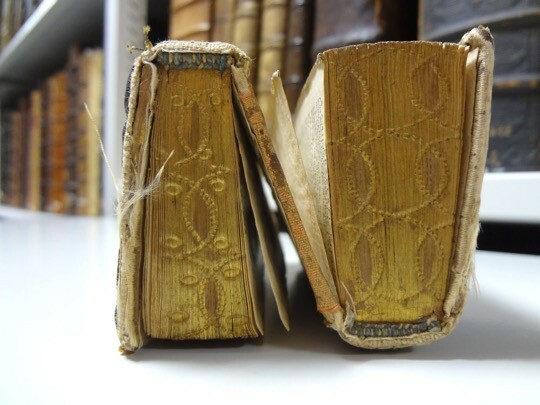 The dos-à-dos binding was used on purpose – to put two complementary books in one. For instance, you could have the Old Testament on one side, and the New Testament on the other. This unique book is a variation of dos-à-dos books. The special thing about this volume is that it can be opened – and read – in six different ways. In other words, contains six different books. Each one is bound separately, and closed with its own clasp. Then they are cleverly hidden inside a single binding. The book was printed in Germany and contains religious devotional texts, including Martin Luther’s Der Kleine Catechismus. It’s a part of the collection of the Rogge Library in Strängnäs, Sweden. This rare, and a bit peculiar, kind of a book was produced in the 17th century. Called “hornbook,” it’s a children’s book. It usually contained alphabet and a collection of easy short texts, helping to learn to read. The weight of a book at that time was much bigger than today. Therefore the stick had a purpose. The child could easily grab a hornbook with one hand and raise it at eye height. 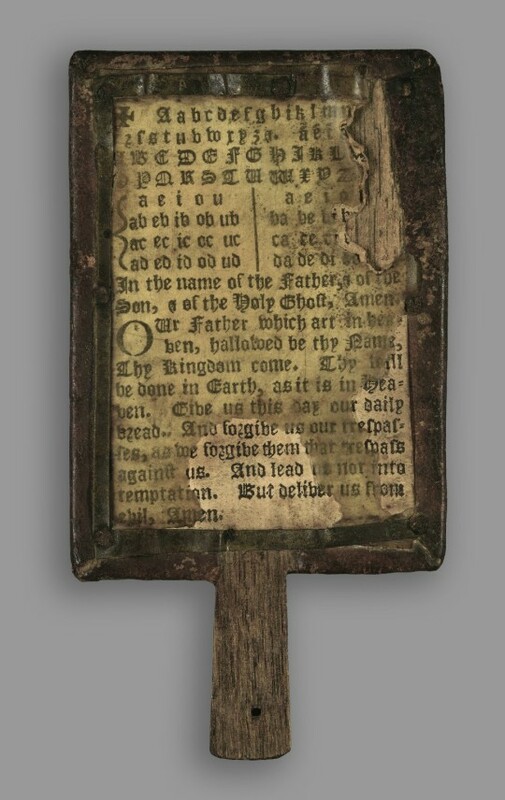 Why “hornbook”? 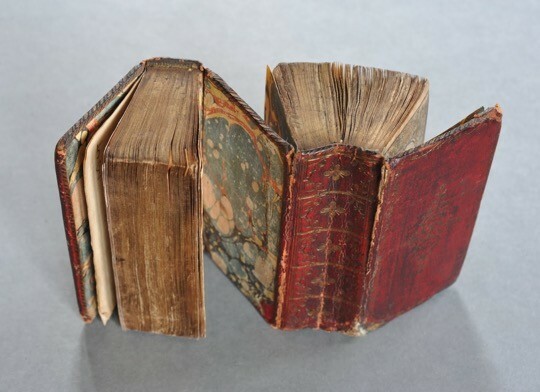 These books were made to survive intensive use, just like today’s heavy-duty tablet cases. 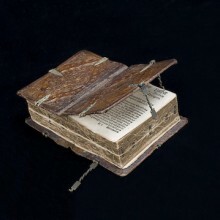 The books were printed on a sheet of paper that was subsequently covered by a thin piece of horn. You could drop such a book without making too much damage. 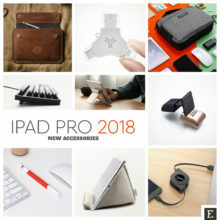 This is a stunning example of what would happen if we start thinking about how to enhance the print book with modern-day inventions. Enciclopedia Mecánica (Mechanical Encyclopedia) is widely considered one of the predecessors of the ebook. This incredible device operated using pressurized air. Thanks to that the reader was able to add different spools containing the pre-loaded content. It also had a zoom function, so that the reader could focus on a specific text. 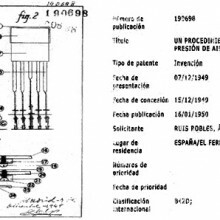 The inventor had plans to add a reading light, a calculator, and sound to next prototypes of the Mechanical Encyclopedia. The only prototype is exhibited in the National Museum of Science and Technology in La Coruña, Spain. 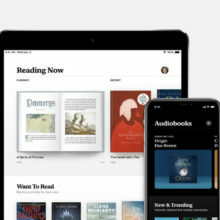 “Blink” stands for “book+link.” It is one of the most outstanding examples of how technology could bring printed books to the digital world. 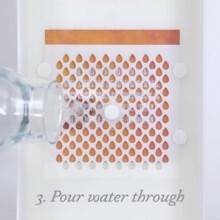 The secret of Blink, created by Manolis Kelaidis from The Royal College of Art in London, is that some parts of the text are printed with conductive ink, forming links or buttons. When you touch a linked word, your finger will complete a circuit. 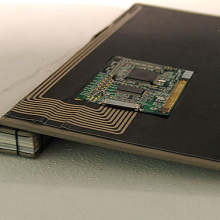 The book will send a command to a nearby computer, connected via a Bluetooth module hidden in the back cover. Thanks to that, Blink can serve as a real-world interface to perform certain tasks on the web, such as looking for a definition of a specific word, or a Wikipedia entry for a topic. It takes a lot of creativity to craft a daily use object on a much bigger scale. 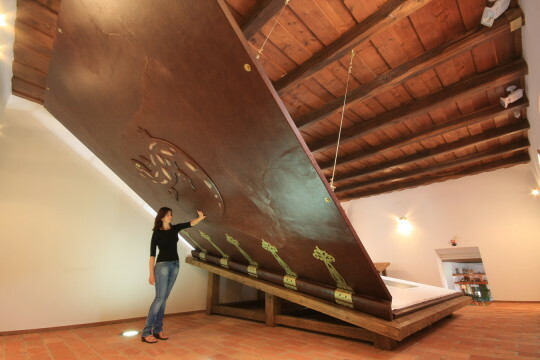 The book you see above is over 4 meters high, 7 meters wide when opened, and weights as much as 1,420 kg. 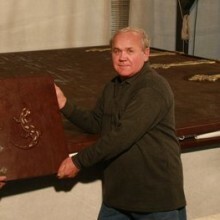 It was crafted in Hungary by Béla Varga and Gábor Varga. In May 2010 it entered the Guinness World Records as the largest book in the world. The paper was imported from an Austrian paper mill. 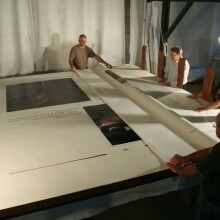 All 346 pages were printed on a large-scale printer used for billboard ads. It took a lot of effort to place the book inside the building, the renovated watermill being the official museum of the book. It’s located in the Aggtelek National Park. This book is simply beautiful. 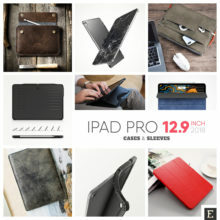 It was designed and crafted by Maria Fischer as her diploma work at the University of Augsburg. Traumgedanken (Dream Thoughts) is a collection of scientific, philosophical and poetic texts, connected with each other by a gently stitched thread. 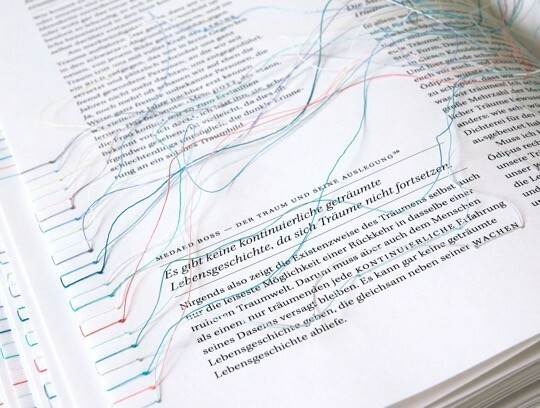 The book is designed as a model of a dream about dreaming… The threads visualize their confusion and fragileness. The book, made in the digital times, is not only a symbol of the logic of dreams but a physical metaphor of the internet. 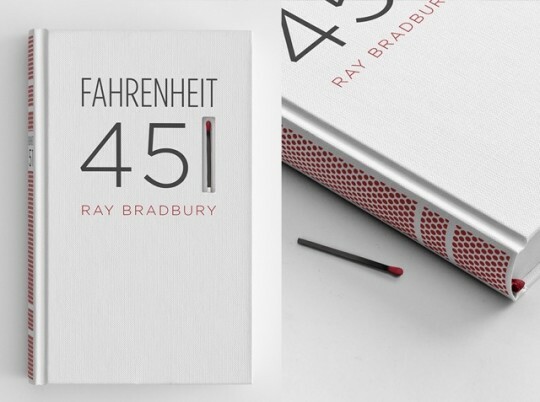 This exceptional idea could only work for one exceptional book, Fahrenheit 451 by Ray Bradbury. The book contains a match, embedded in the front cover, in a shape of the digit “1” from the title. 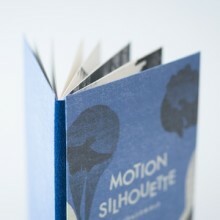 The spine is covered with a matchbook striking paper surface so that the book can be burned. 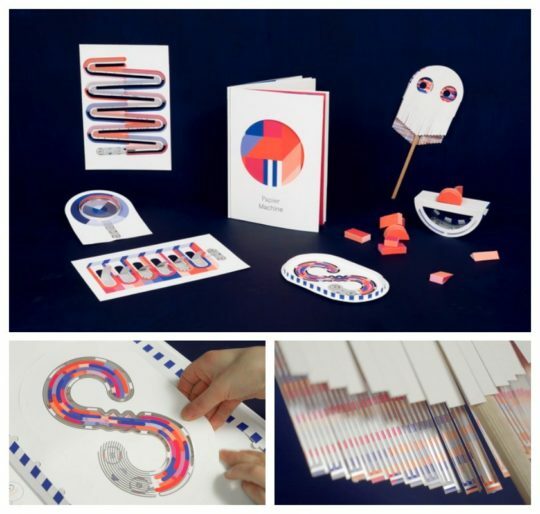 The idea was designed by Elizabeth Perez when she studied at The Austin Creative Department design school. 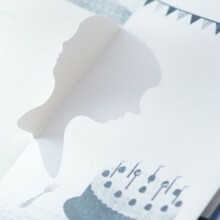 Motion Silhouette is a fabulous children’s picture book by Japanese artists Tathuhiko Nijima and Megumi Kajiwara. 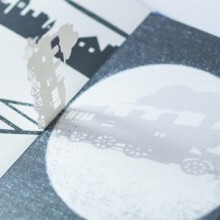 The book was designed to show how to use the surroundings – in this case, light silhouettes – to change the perception of the book, and add up to the story. Between the pages, there are tiny pop-up elements. As the reader turns the page, pop-ups create wonderful, phantasmagoric shadows that move freely on a page. 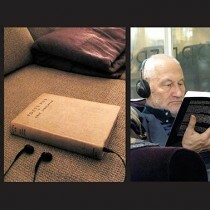 This book explores new ways to experience reading. 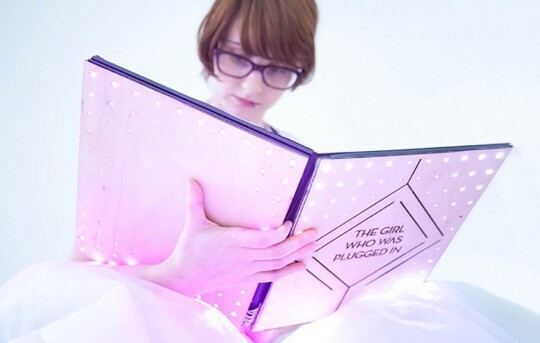 Entitled The Girl Who Was Plugged In, it was created by Felix Heibeck, Alexis Hope, and Julie Legault. 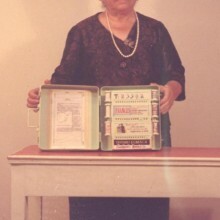 It is most probably the first sensory book in the world. 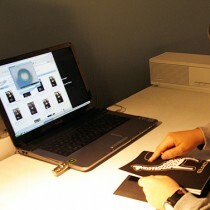 It consists of two parts: the print book with a set of 150 programmable LEDs embedded in the cover, and the wearable with heating, vibration, and compression systems. The book, written by James Tiptree, triggers a wide range of feelings. The emotions experienced by a protagonist are passed to the wearable. It could be a change of the heartbeat rate (through air pressure bags) or localized temperature fluctuations. 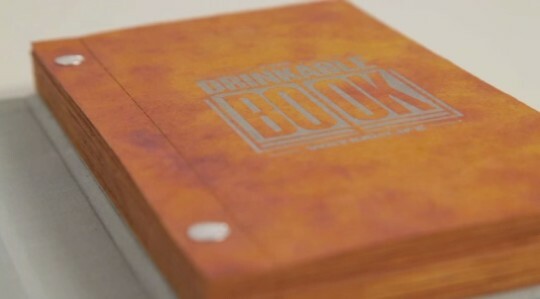 Created by the non-profit organization WATERisLIFE, The Drinkable Book cannot be drunk itself, but helps people drink water. It’s printed on a filter paper capable of killing deadly waterborne bacteria. Each page is coated with silver nanoparticles. It’s thanks to them diseases like cholera, typhoid and E. coli are instantly killed. A single book is capable of providing someone with clean water for up to 4 years, but it’s not only the cleaning tool. It also teaches proper sanitation and hygiene to those in the developing world. When you are holding this extraordinary book, and turn the pages, its cover “warms up,” slowly revealing the beautiful, multi-layer design. A special black thermal ink was used to produce this stunning effect. The ink was printed over the four color layers. Each layer was designed by a different artist, and each one refers to what the book is about – Rhetoric as the Art of Design. This book designed by a Hungarian graphic designer Márton Borzák is filled with invisible pictures and annotations printed with UV ink. 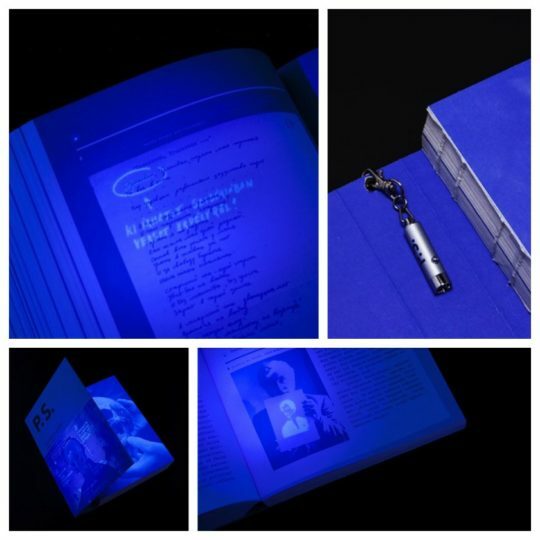 The reader can explore these secrets with a small UV light attached to the inside of the book spine. The book, entitled P.S: Secrets Of The Barguzin Skeleton, and written by Tibor Borzák, analyzes the controversy around a European man’s skeleton that was found in the Siberian barguzin. 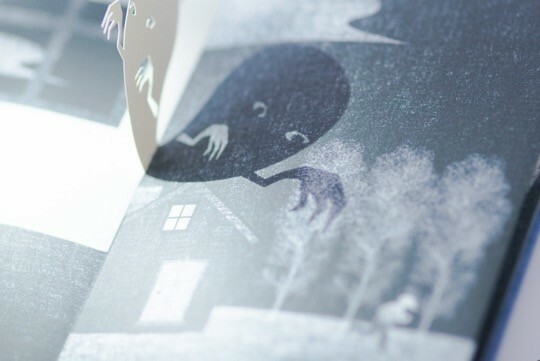 At first glance, it’s just a beautiful children’s book. But it has the power like no other book. It can grow into a tree. The book is a part of the Tree Book Tree campaign, run in Argentina by children’s publisher Pequeno Editor, and designed to teach children where books come from. 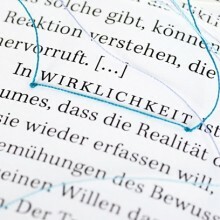 An eco-friendly ink was used to print the text and illustrations on an acid-free paper. But that’s not all. Jacaranda seeds are embedded in the pages. 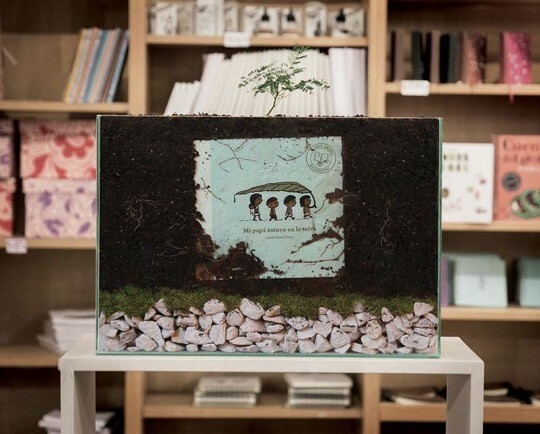 When you plant the book in the ground and take care of it, it will eventually grow into a beautiful tree. Invisible is a book you can only read in the same conditions in which it was written – outside, and in the cold. When you open it, you see blank pages. 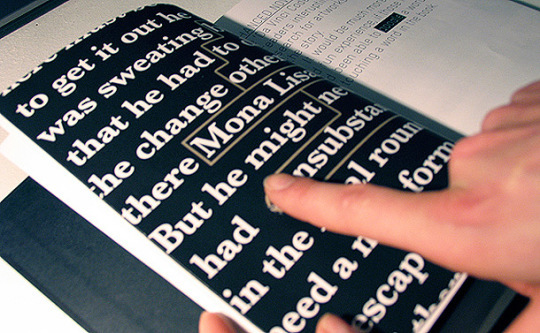 A special temperature-sensitive paint was used to print the text. The letters, the words, the sentences will become readable only if the temperature is lower than 0 degrees Celsius (32 degrees Fahrenheit). 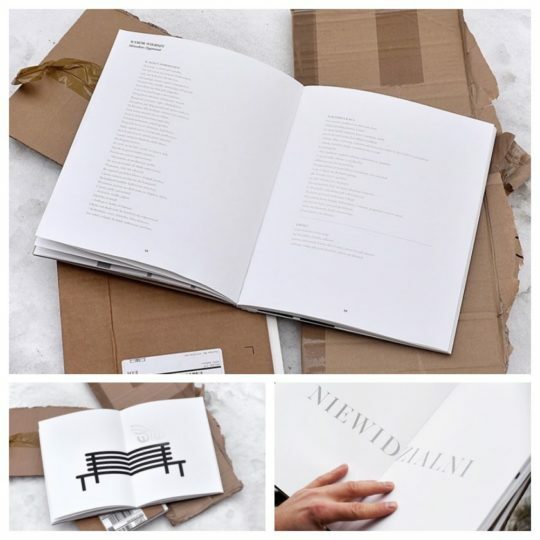 The publication includes texts written by homeless people, who frequently visit the soup kitchen in Warsaw, Poland, run by Kapucynska Foundation, a non-profit organization focused on helping the poor. Texts selected for Invisible range from poems to memoirs, to essays. You’ll also find here a literary reportage and even a play script. Papier Machine is a cleverly designed book that explains the world of electronics through the absorbing combination of paper, conductive ink, and graphics. At first sight, it looks like a beautifully designed book. However, instead of regular pages, you will discover inside six paper games that are ready to be assembled. The pages are pre-cut and pre-folded to make assembling them easier. They are covered with different kinds of ink, including the one that conducts electricity. Each of the six toys is focused on unveiling one of the processes electronic devices rely on: resistance, gyroscope, playing track, wind sensor, writing track, and tilt switch.